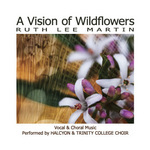 A vision of wildflowers : vocal & choral music / Ruth Lee Martin ; Halcyon & Trinity College Choir. I heard a loud voice in heaven / Ruth Lee Martin. This work is part of a series of vocal and choral works I have been commissioned to write as a part of a Creative Arts Fellowship from ArtsACT, Canberra. The text was selected by Philip Nicholls as part of Evensong which includes a combined sacred choral gathering in Newcastle in September, 2009. 27 Sep 2009: at Evensong (Christ Church Cathedral (Newcastle NSW)).